Background Leprosy is a chronic infectious disease caused by Mycobacterium leprae and manifested by an immunological and clinical outcome, ranging from borderline lepromatous and lepromatous infections to tuberculoid and borderline tuberculoid infections. Cytokines such as interleukin (IL)-6, IL-10, interferon-γ (IFN-γ), and tumor necrosis factor-α are associated with leprosy. Objective The aim was to assess IL-6 and IFN-γ in untreated patients with leprosy and compare these levels with those in healthy controls and with different parts of the disease spectrum. Patients and methods A case–control study was conducted on 90 untreated patients with leprosy and 30 healthy controls randomly selected from patients attending the Dermatology and Leprosy Hospital, Qena Governorate, Egypt. The patients were classified into tuberculoid, borderline tuberculoid, borderline-borderline, borderline lepromatous, and lepromatous (LL). 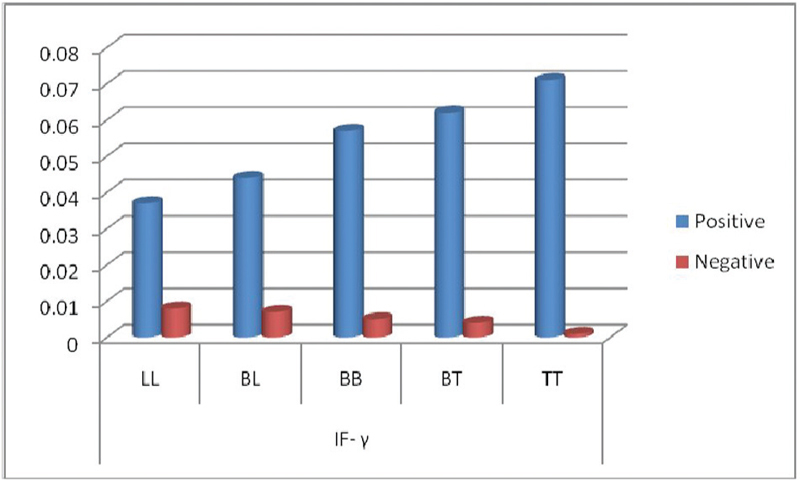 IFN-γ and IL-6 were measured by enzyme-linked immunosorbent assay technique. Results IL-6 and INF-γ were significantly higher in the patients than in the control group, with P value of 0.001 and 0.002, respectively. 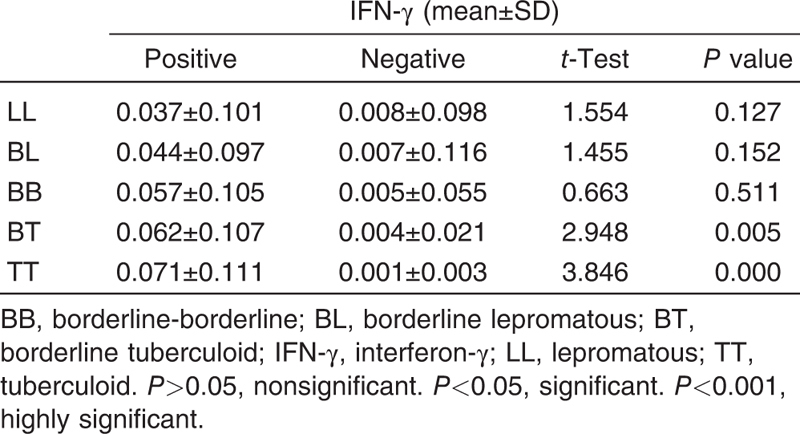 Regarding the serum level of INF-γ in all types of leprosy, there was a statistically significantly increase in paucibacillary leprosy and a nonsignificant increase in multibacillary leprosy; on the contrary, the results showed that serum level of IL-6 was statistically significantly increased in multibacillary leprosy and nonsignificantly increased in paucibacillary leprosy. Conclusion This study concluded that INF-γ and IL-6 may have a significant role in classifying various forms of leprosy and can be used as leprosy disease markers to predict the course and the prognosis of the disease. Leprosy is a chronic granulomatous infection caused by Mycobacterium leprae (M. leprae), with a predilection primarily for peripheral nerves and secondarily for the skin, mucous membrane, and internal organs. Its clinical forms depend on specific host immunity . M. leprae infects macrophages and Schwann cells, causing peripheral nerve damage, which results in sensory and motor losses, which ultimately cause severe disability, the hallmark of leprosy. Leprosy actually manifests across a bacteriologic, clinical, immunologic, and pathologic spectrum that allows classification into five forms according to the Ridley and Jopling (R&J) scale . The classification of R&J divides leprosy into two polar forms: tuberculoid (TT) and lepromatous (LL). An immunologically unstable intermediate group separates the two polar forms and is divided into three subgroups: borderline tuberculoid (BT), borderline-borderline (BB), and borderline lepromatous (BL). These groups are classified according to clinical characteristics, skin smear bacillary index, and histopathological features ,. Cytokines are low-molecular-weight glycoproteins produced by immune and nonimmune cells which act as molecular signals for communication between cells of the immune system . Th1 cells secrete interferon-γ (IFN-γ), interleukin (IL)-2, and tumor necrosis factor, which activate macrophages, but Th2 cells secrete IL-6, IL-5, and IL-4, which are responsible for antibody formation, macrophage inhibition, and cell–mediated immunity (CMI) suppression . Owing to the presence of controversial results on the level of serum cytokines in various forms of leprosy, we aimed in this study to assess serum cytokine IL-6 and IFN-γ in untreated patients with leprosy, and compare them with healthy controls and co-relate the patterns with different parts of leprosy spectrum. However, future large-scale studies are also needed to clear the role of cytokines in classifications, prognosis, and treatment of leprosy. A case–control study was conducted on 90 untreated patients with leprosy (new cases, age: 18–65 years) and 30 healthy controls. The participants were selected randomly from patients attending the Dermatology and Leprosy Hospital, Qena Governorate, Egypt from April 2013 to April 2015. Patients, classifications were performed according to clinical examination and slit skin smear into subgroups (TT, BT, BB, BL, and LL). The patients who received antileprotic treatment or steroid and patients who had other systemic diseases that affect the immune system were excluded from the study. The study was approved by the Research Ethics Committee of Qena Faculty of Medicine, South Valley University. An informed consent was obtained from all participants. IFN-γ was chosen to represent Th1 cytokine pattern, and IL-6 was chosen to represent Th2 cytokine. Both cytokines were measured by enzyme-linked immunosorbent assay technique (Bacton Dickinson Kit, USA) for estimation of serum IFN-γ (Assay Max ELISA kit supplied by the Assay Max; Catalog No. EI1023-1 (1X 96 tests). Assay-pro LLC- St. Charles, MO, USA) and IL-6 (Assay Max ELISA kit supplied by the Assay Max; Catalog No. EI1006 (1X 96 test), Assay pro LLC- St. Charles, MO, USA). The Mann-Whitney U test was applied for comparison between two groups. Correlations between cytokine levels using raw data were measured by Spearman’s rank test. Results were considered statistically significant when the P values were <0.05. The data was be analyzed using SPSS for windows version 16 to compare patient groups with control group. The correlation coefficient (r) was applied between serum cytokine levels and different variables in the patient groups. This study included 90 adult patients with confirmed diagnosis of leprosy, with 53 males and 37 females. Their ages ranged from 18 to 65 years, with a mean of 41.4±11.2 years. A total of 30 healthy participants were included as a control group: 16 females and 14 males. Their ages ranged from 30 to 39 years (mean: 33.9±3.2 years). 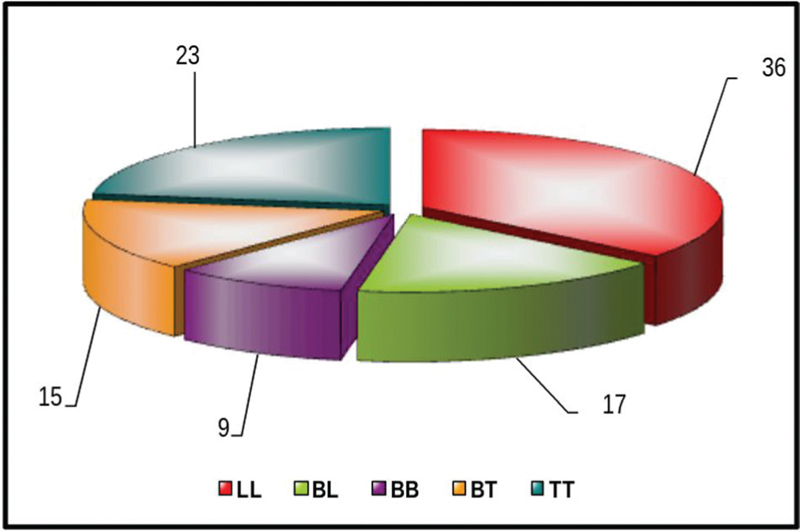 The patients were classified according to R&J classification as 27 having LL, 14 BL, 13 BB, 16 BT, and 20 TT ([Figure 1]). The patients and control were classified into positive and negative according to the serum level of IL-6 and INF-γ (ng/mg). The positive group of IL-6 ranged from 0.5 to 0.004 ng/mg, and the negative group less than 0.004 ng/ml. The positive group of INF-γ ranged from 1 to 0.007 ng/mg, and the negative less than 0.007 ng/mg. Figure 1 Leprosy types of patients according to presence of IL-6 in the serum (ng/ml). The IL-6 level in patients and control groups was 0.1178±0.2493 and 0.0002±0.0003 ng/ml, respectively, and P value was 0.001, with highly statistically significant difference ([Table 1]). INF-γ level in the patients and controls was 0.0546±0.1019 and 0.0055±0.0222 ng/ml, respectively, and P value was 0.002, with highly statistically significant difference. So in the patient group, the mean serum levels of both cytokines (IL-6 and INF-γ) were significantly higher than the control group ([Table 2]). 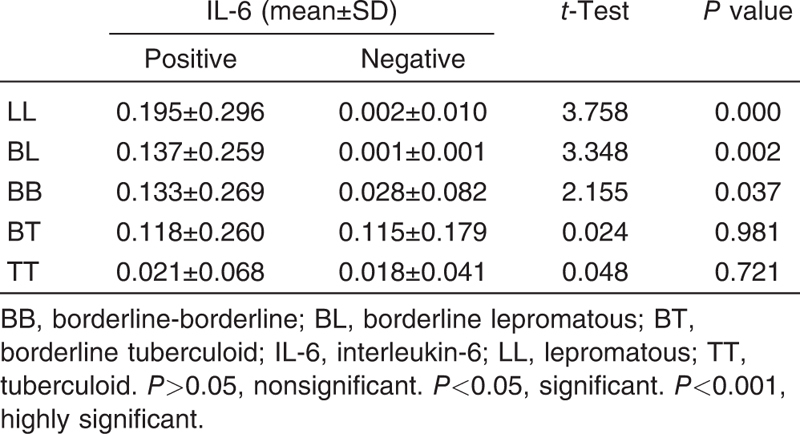 Regarding the total serum level of IL-6 in the patients with different types of leprosy, there was a highly statistically significant increase in serum level in LL group (mean: 0.195±0.296 ng/ml; P=0.000), significant increase in serum level in BL group (mean: 0.137±0.259 ng/ml; P=0.002) and BB group (mean: 0.133±0.269 ng/ml; P=0.037) (multibacillary leprosy), and nonsignificant increase in serum level in BT group (mean: 0118±0.269 ng/ml; P=0.981) and TT group (mean: 0.018±0.041 ng/ml; P=0.721) (paucibacillary leprosy), so patients with LL had the lowest levels of IFN-γ and highest level of IL-6 ([Table 3] and [Figure 2]). Figure 2 Leprosy patients according to Ridley and Jopling WHO Classification. Regarding the total serum level of INF-γ in patients with all types of leprosy, there was a highly statistically significant increase in serum level in TT group (mean: 0.071±0.111 ng/ml; P<0.000), a significant increase in serum in BT group (mean: 0.062±0.107 ng/ml; P=0.005) (paucibacillary leprosy), and nonsignificant increase in the serum level in BB group (mean: 0.057±0.105 ng/ml; P=0.511) and in BL group (mean: 0.044±0.097 ng/ml; P=0.152) and in LL group (0.037±0.101 ng/ml; P=0.127) (multibacillary leprosy), so patients with TT had the lowest levels of IL-6 and highest levels of IFN-γ ([Table 4] and [Figure 3]). Figure 3 Leprosy types of patients according to presence of IF-γ in the serum (ng/ml). In our study, the mean serum levels of both cytokines (IL-6 and INF-γ) were significantly higher in the patients than in the control group. Patients with TT had highly statistically significant increased levels of IFN-γ and lowest levels of IL-6, indicating that there could be maximum stimulation of CMI and activation of Th1 cells, and LL group had significantly higher levels of IL-6 as compared with other groups. Regarding the serum level of INF-γ in all types of leprosy, there was a statistically significant increase in paucibacillary leprosy and nonsignificant increase in multibacillary leprosy, which is in contrast to the results of serum level of IL-6, where there was a statistically significant increase in multibacillary leprosy and nonsignificant increase in paucbacillary leprosy. Patients with paucibacillary leprosy show a pattern of CMI of the Th1 type, which is characterized by the production of IFN-γ, IL-2, IL-7, IL-12, IL-15, and IL-18 in skin lesions. Conversely, patients with multibacillary leprosy present a Th2 response with production of TGF-β1, IL-4, IL-5, IL-6, and IL-10 in skin lesions with high antibody production, but insufficient CMI . There are conflicting reports about the status of Th1/Th2 subsets in patients with leprosy. Th1 cytokines was evident in TT, whereas Th2 cytokines were predominant in LL skin lesions, indicating that resistance and susceptibility could be co-related with cytokine patterns . Combination of Th1 and Th2 cytokines was also reported in circulation and in skin lesions , so cytokine profiling and clinical forms of leprosy are debatable and need more clearance. Moubasher et al. 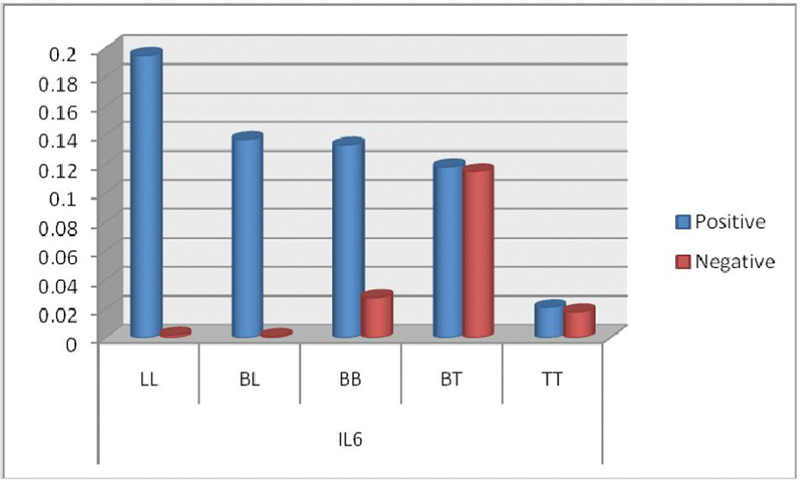 reported higher levels of IFN-γ in BT compared with BB, BL, and LL. Thus, the main actions of IFN-γ are amplification of–T-cell response and marked alteration in the behavior of infected macrophages . Th1 cytokines cause activation of macrophages by bringing about biochemical, phenotypic, and functional changes, which can increase their microbicidal activity . The protective function of IFN-γ was demonstrated by the reduction of viable M. leprae at the site of intradermal injection of IFN-γ, as shown independently by Kaplan et al. and Siva Sai et al. . Some authors reported that 91% of patients with LL produced IL-6 in comparison with only 33% of patients with tuberculoid leprosy in their study. These Th2 cytokines are reported to inhibit Th1 cytokine production (particularly IFN-γ) and vice versa . Seghal  have reported that IL-6 is known to promote antibody production, so the high level of this cytokine may have some bearing on the hypergamma globulinemia that characterizes the lepromatous part of the spectrum.A predictive study of antigen-induced and mitogen-induced IFN-γ production was studied in peripheral blood mononuclear cells from 34 patients with leprosy. Overall, 17 of the 18 patients with LL and BL failed to release IFN-γ in response to specific antigen (M. leprae) and displayed reduced responses to mitogen (concanavalin A) stimulation . In contrast, cells from six patients with TT and BT produced considerable levels of IFN-γ under the same experimental conditions. A case–control study observed a correlation between plasma levels of IL-6 and IL-6 genotypes in patients with type-2 reactions in leprosy and also showed that the use of IL-6 as a biomarker in several diseases has been widely discussed based on the multiple effects of this cytokine on the control of innate and adaptive immunity . Aggarwal et al. observed that a multifunctional cytokine, IL-6, has suppressive effects on macrophages, astrocytes, and fibroblasts and suppresses the expression of IL-12, IFN-γ, tumor necrosis factor-α, adhesion molecules, and proteases both in vitro and in vivo. The overall role of IL-6 in an inflammatory process is determined by the balance between its proinflammatory and anti-inflammatory actions on different cell types. Therefore, future larger scale studies are needed to clear the role of cytokines in classification, prognosis, and treatment of leprosy. Medeiros MZ, Hans Filho G, Takita LC, Santos Vicari CF, Barbosa AB, Couto1 DV. Verrucous lepromatous leprosy: a rare form of presentation − report on two cases. An Bras Dermatol 2014; 89:481–484. Sampaio LH, Stefani MM, Oliveira RM, Sousa AL, Ireton GC, Reed SG, Duthie MS. Immunologically reactive M. leprae antigens with relevance to diagnosis and vaccine development. BMC Infect Dis 2011; 26:11–26. Garbino JA, Virmond Mda C, Ura S, Salgado MH, Naafs B. Randomized clinical trial of oral steroids for ulnar neuropathy in type 1 and type 2 leprosy reactions. Arq Neuropsiquiatr 2008; 66:861–867. Madan NK, Agarwal K, Chander R. Serum cytokine profile in leprosy and its correlation with clinicohistopathological profile. Lepr Rev 2011; 82:371–382. Belgaumkar VA, Gokhale NR, MahaganI PM. Circulating cytokines profiles in leprosy patients. Lep Rev 2007; 78:223–230. Jarduli LR, Sell AM, Reis PG, Sippert EA, Ayo CM, Mazini PS et al. Role of HLA, KIR, MICA, and cytokines genes in leprosy. Biomed Res Int 2013; 2013:10.1155. Yamamura M, Uyemura K, Deans RJ, Weinberg K, Rea TH, Bloom BR, Modin R. Defining protective responses to pathogens: cytokine profiles in leprosy lesions. Science 1991; 254:277–279. Moubasher AD, Kamel NA, Zedan H, Raheem DD. Cytokines in leprosy, II. Effect of treatment on serum cytokines in leprosy. Int J Dermatol 1998; 37:741–746. Sengupta U. Immunopathology of leprosy − current status. Ind J Lepr 2000; 72:381–391. Silva EA, Iyer A, Ura S, Lauris JR, Naafs B, Das PK, Vilani-Moreno F. Utility of measuring serum levels of anti-PGL-I antibody, neopterin and C-reactive protein in monitoring leprosy patients during multi-drug treatment and reactions. Trop Med Int Health 2007; 12:1450–1458. Kaplan G, Nusrat A, Sarno EN. Cellular responses to the intradermal injection of recombinant human interferon gamma in lepromatous leprosy patients. Am J Pathol 1987; 128:345–353. Siva Sai KSR, Prasad HK, Misra RS. Effect of recombinant INF gamma administration on lesional monocyte/macophages in lepromatous leprosy patients. Int J Lepr Other Mycobact Dis 1993; 61:259–269. Ochoa MT, Valderrama L, Ochoa A, Zea A, Escobar CE, Moreno LH, Falabella R. Lepromatous and tuberculoid leprosy: clinical presentation and cytokine responses. Int J Dermatol 1996; 35:786–790. Seghal PB. Molecular pathophysiology. J Invest Dermatol 1990; 94:2s–6s. Nogueira N, Kaplan G, Levy E, Sarno EN, Kushner P, Granelli-Piperno A et al. Defective gamma interferon production in leprosy. Reversal with antigen and interleukin 2. J Exp Med 1983; 158:2165–2170. Sousa A, Vinicius M, Sampaio L, Martelli C, Costa M, Mira M, Stefani M. Genetic and immunological evidence implicates interleukin 6 as a susceptibility gene for leprosy type 2 reaction. J Infect Dis 2012; 205:1417–1424. Aggarwal S, Ali S, Chopra R, Srivastava A, Kalaiarasan P. Genetic variations and interactions in anti-inflammatory cytokine pathway genes in the outcome of leprosy: a study conducted on a MassARRAY platform. J Infect Dis 2011; 204:1264–1273.